found approximately 160km north of Roma, towards the iconic Carnarvon Gorge. Wallaroo Outback Retreat is an atmospheric lodge like building built from timber milled on the property. It has a fully equipped kitchen with all the cooking and serving equipment you could ever need as well as six individual bathrooms. Scattered behind the Retreat are eight fabulous glamping tents. Wake up amongst the towering Eucalypts listening to the magical sounds of the bush in crisp white linen on real posture pedic beds. This is camping at its best! 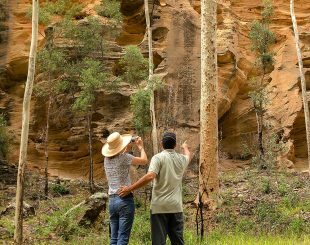 Enjoy a yarn, a glass of wine and some camp oven cooking around the rustic fire pit while spotting for rock wallabies against the cliffs. The Retreat is ideally suited to a group of friends or colleges chasing a truly Outback experience. It can be your own private destination for groups of up to sixteen guests. The Retreat is perfect as a venue for celebrations with family and friends, workshops of all descriptions, conferences and meetings as well as a place to relax and explore with friends over an extended weekend. Make Wallaroo Outback Retreat your very next destination – it’ll be an experience you’ll never forget! Eight fabulous glamping tents set amongst towering Eucalypts, with crisp white linen and real posturepedic beds. Available for family and friend celebrations, workshops, conferences, meetings and more. ©Wallaroo Outback Retreat 2019. All rights reserved.